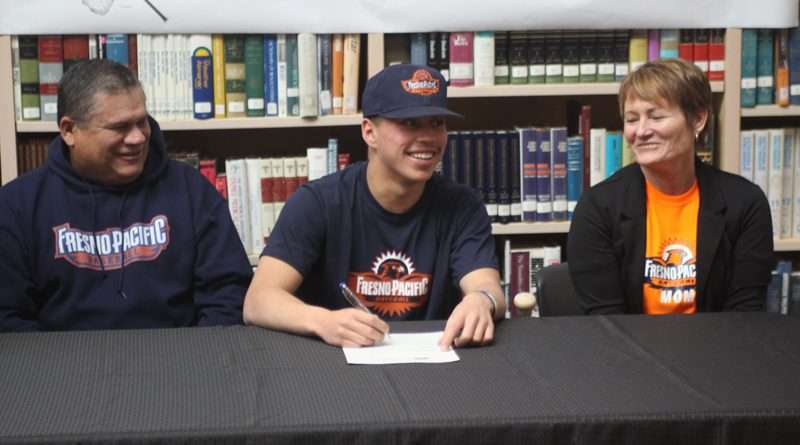 Cole Dyer, a lifelong athlete, a straight “A” student, Lassen High Grizzly and now signed to play for the Fresno Pacific University baseball team. 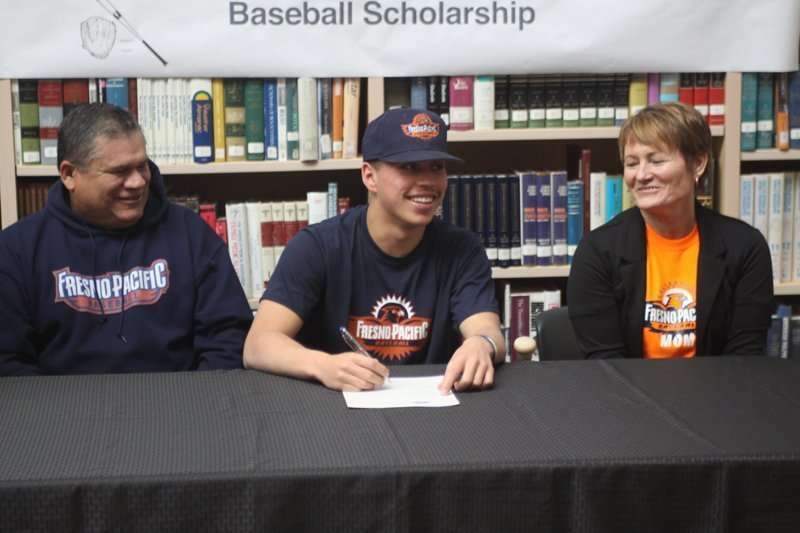 Dyer signed a letter of intent to attend and play for the Fresno Pacific University NCAA Division II baseball team Tuesday, Nov. 13 at the Lassen High School library. Staff, friends, parents and previous coaches and players were there to give their support and admiration for Cole. Previous coaches stood to tell how Cole has impacted their lives and teams they’ve coached from Little League coach Ed Lively, to varsity baseball coach Scott Foreman, who told those in attendance Cole had been a model player and a varsity baseball player starting his freshman year at Lassen High School. For his last season of baseball with the Grizzlies, Cole is the only player who wasn’t a senior last year and is the lone returning varsity player. As a junior Cole boasted some impressive stats last year, he was named all league player, and defensive player of the year for Lassen High School with a batting average of .359, 15 RBIs, an on base percentage of .446 and a total of 23 hits. As a catcher for most of the last four years for the Grizzlies, Cole was also picked up by Fresno Pacific as a catcher. Picked by Fresno Pacific University, Cole joins a ball club where many great baseball players have come out such as Aaron Judge, Justin Haley and even Ted Wills. With a GPA of 3.8, Cole was not only eligible for the athletic scholarship of $15,000 he was also given an academic scholarship of $13,000. Look for Cole at the ballpark this spring as he plays catcher for the Grizzlies for one last season.